Defendants are notoriously poor judges of lawyers’ competence. Criminal defense lawyers often want the bulk of their money up front, which means that you will have to come up with some cash in fairly short order. Because jailed defendants usually have no money, they have to find family members or friends who will put up the money. Courthouse visits. Defendants can visit a local courthouse and sit through a few criminal hearings. If a particular lawyer impresses a defendant, the defendant can ask for that lawyer’s card (after the hearing has concluded) and then call for an appointment. Right from the start, tell your lawyer all that you know. Remember, lawyers must maintain confidential relationships. Waiting until the last minute to communicate something with your lawyer wastes money. Brush up on matters related to your legal affairs. Ask good questions and establish intelligent communication. Keep copies of important documents in your own files. Be certain you've found the lawyer who's right for you . Changing lawyers after the legal process has started can be very expensive. Understand the fee agreement you and your lawyer agree upon, and question unclear charges before you pay them. Insist your lawyer honors thrift if out-of-pocket expenses are part of the fee agreement. Ask if there's anything you can do or gather to help the process. Be prepared and honor deadlines at all your meetings. Ask your lawyer about all alternatives to the dispute's resolution. "... res ipsa loquitur, ..."
This article will highlight some of the best tips for working with a lawyer. Although it may seem like a strained relationship right off the bat, if you can form a solid bond with your legal representative, it may have a big impact on the future success of your case. If you feel comfortable working with your lawyer, and, in turn, your attorney feels comfortable working with you, it can do wonders for your case, not to mention reduce the stress that you will likely be putting on yourself when at trial. However, like any type of relationship, the relationship that you have when working with a lawyer is a two way street, meaning that your attorney will have to work at it just as much as you will. Lawyers can work on attorney-client relationships in many ways, but perhaps the best means is to keep lines of communication open. A good attorney will always update you with necessary information and also be able to answer questions for you in a timely fashion. In addition, good attorneys will also help you prepare for important moments in your case, like testifying in court or answering questions at a deposition. As just mentioned, you too will also have a great impact on the working relationship that you have with a lawyer. There are plenty of steps that you can take that will better the workflow and ultimately save you time and money, and may even increase your chances of winning your case. Pass on pertinent information . After you have gone through the process of selecting and hiring a lawyer to represent you in your case, you should round up every scrap of information that is relevant to your case and give it all to your attorney. Give as much information as possible, even if you think it may not be that pertinent. Lawyers are much like human sieves when it comes to information; they can sort out what will be needed in the lawsuit much better than you will be able to. The information that they find may be used to bolster certain parts of your case. In addition, some types of information can also be used to predict what kinds of arguments will be brought against your case. Be sure to keep copies of all the information that you give your lawyer, though, in case something terrible happens like a fire at the law office. Do what is asked . Not only should you do what your lawyer asks you to do, but you should also do it well. At the beginning of your legal representation, your attorney will most likely ask you to write down everything that has happened up until you hired your attorney. They do this for many reasons, but perhaps the most important is to make sure that they file your case on time. Often, if you do not complete this timeline, the lawyer may miss crucial deadlines that could stop your case before it starts. Get requested information . You will often have better and easier access to certain types of records and information (such as medical histories and reports) than your attorney will. If your lawyer asks you to obtain any of these documents, you should do so as quickly as possible. Remember, the law typically establishes tight deadlines that have harsh consequences if not met. Respond to your lawyer quickly . As just mentioned, there are numerous deadlines in any case that must be met by your attorney. If your lawyer asks you to do something or get a document, he or she probably has a very good reason for asking you to do so. If you cannot respond in a timely manner to your attorney (perhaps you are working out of town for work for two weeks), be sure to tell your attorney about your situation. It will look much better for your case if your attorney is able to ask for an extension of a deadline rather than just missing it with no explanation. Know your schedule and tell your attorney. When working with a lawyer on your lawsuit, you will often need to be in attendance or participate in many parts of your case. For example, in a personal injury case, you may be called upon to answer questions at a deposition about the accident that injured you or about the extent of your injuries. These depositions and other procedures are often scheduled months in advance. If your work or personal schedule will call you away from town at a critical time, let your attorney know so that he or she has the opportunity to try to reschedule the procedure. Be honest . The more open and honest you are with your attorney, the better your case will go. If you were perhaps a little bit tipsy when you were rear-ended by the truck that caused you have severe back pain, you must tell your attorney this. Even if the issue is never brought up during your case, the more that your attorney knows, the better he or she will be able to prepare for your case. It is better for you to be a little embarrassed about telling the truth than it is for your attorney to be blindsided by an argument he never considered before hearing it in court. Ask for explanations . Sometimes lawyers get so caught up in the legal world that they forget that most people have not heard of words like " res ipsa loquitur, " "mandatory pre-trial arbitration," or " stare decisis. " If you are unfamiliar with what is going on in your case, ask for an explanation from your attorney. The more you understand about what is going on, the more you will be able to make important decisions about your case. Working with your lawyer while going through a divorce can be aggravating at times. While you want to get everything over and done with as quickly as possible, it can seem like it is taking forever. Sometimes this is due to the legal process, and other times it may be due to an over-booked lawyer. So how do you know if your lawyer is really working for you or not? And what can you do if your lawyer isn't handling everything properly? Keep reading to find out the answers to these questions and more. Should we use the same attorney? Can I proceed with his lawyer if I can't afford my own? How do I find a good lawyer to handle my divorce? Can he use his brother to represent him? How can I find a lawyer that practices in another state? Can I hire another lawyer to be a co-council? Can I change lawyers once the divorce is started? Can we start over if I get a new lawyer? What if my lawyer was injured and can't continue? Is this a normal line of questioning for a prospective client? Am I violating my retainer agreement if I get a lawyer in another state? Can I ask for a portion of my retainer to be refunded? Does a retainer for hourly and filing fees include serving the petition? How could my retainer be used up before the petition was served? Is my retainer agreement still good if I had to delay my divorce? What if my lawyer won't refund the balance of my retainer? My attorney dropped me after taking my retainer. Can I fire my lawyer and get a refund on the retainer? Do we have to pay more if the retainer agreement states differently? Can I ask that my husband pay my attorney fees? Why do I have to pay my lawyer if he's responsible for legal fees? Can my lawyer fine him $125/day until he submits financial papers? Can I get out of paying my lawyer's interest fees? Can my lawyer sue me for not paying the final bill? What if I can't afford the growing legal fees in my custody battle? How do I fire him and dispute his questionable billing? What if my lawyer threatened to sue me if I don't pay more? Will my lawyer's fees be taken out of the settlement escrow? Can my lawyer talk with my husband if he isn't represented? Can I communicate directly with his lawyer if I represent myself? Can I ask his lawyer what's going on if mine won't respond? What if his attorney makes rude comments to me? What if my lawyer isn't advising me about my visitation case? Is it normal to not hear from your lawyer for two months? What can I do if my lawyer won't call back? My lawyer refuses to talk to me after I filed a grievance. What if the court is threatening to dismiss my case? Should I file a complaint because my divorce is taking so long? What could happen if I tell the judge I wasn't satisfied with my legal representation? What if his lawyer keeps delaying proceedings by not showing up? What if my lawyer is dragging my divorce out? Can he get a delay because he fired his first lawyer? What if my husband keeps changing lawyers to stall the divorce? Do I need to get a new lawyer to push my case along? How can I get my legal aid lawyer to finish the case? Can my attorney drop me if I've been paying on time? What can I do if my attorney won't to represent me anymore? What options I do have if my free attorney dropped me? Is a court appearance needed if my lawyer withdraws from my case? Would a judge grant the withdrawal this close to the court hearing? Can my lawyer refuse to release my file after quitting? Why did my attorney seal the file that states why he quit? Would she be better off representing herself or using a lawyer? Will my husband's relationship with the court clerk impact our case? Can I set a trial date to get the final decree without a lawyer? What should I do if I would like to proceed without a lawyer? Can I represent myself after I fired my lawyer? Can my lawyer reveal what is discussed to my in-laws? Isn't it my lawyer's responsibility to arrange visitation? Is it legal for her to use the lawyer she works for to do the papers? Should my lawyer ask me to write up my own papers for alimony? What if my lawyer isn't working on my case? Should I file a complaint if my lawyer is late for court and doesn't tend to matters in a timely manner? What if I don't trust my lawyer's advice? What recourse do I have if my lawyer didn't do a good job? What if my lawyer didn't remove untrue facts from the final papers? Can my lawyer suggest mediation to his lawyer without asking me? What if my lawyer finalized the decree without consulting me? Can my lawyer tell the judge that he disagrees with the settlement? prepare you for your trial. not expect your lawyer to be your friend. If you feel your lawyer is not serving your best interests, see What to Do When You're Mad at Your Lawyer. When a lawyer screws up, you may want to sue him, but proving malpractice isn't easy. Be cautious. Don't be drawn in by flashy marketing schemes or blanket statements that assure success. Be suspicious of any attorney who guarantees you a specific result in a criminal case before making a court appearance and before reviewing all the documents and evidence. No attorney should make promises before the case truly begins. Ask to examine a sample contract before signing with an attorney. Be wary of attorneys who want a large amount of money up front to handle a case only through initial proceedings and not through jury trial. The lawyer should be honest about the likely outcomes of your case and should never make promises about guaranteed outcomes. Calculate the cost of hiring an attorney. The cost of an attorney is generally based on how complex a case is. Attorneys will typically ask for a retainer (payment) when the defense will most likely require the bringing in of expert witnesses or if there will be extensive motions made. Attorneys have a number of ways of charging for their work. These include flat fees, hourly rates and fees for specific parts of the case. Hourly rates can be the most affordable, but are also the least predictable. It is difficult to predict precisely how much time your case will take. Flat fees are the most predictable but can hurt the client in cases that are complicated. Many attorneys will offer a fee agreement that offers a refundable minimum retainer but then goes up as the case goes past that amount. Misdemeanor cases may cost several thousand dollars in legal fees. Felony cases generally start at $5,000 and can run much higher if the felony is very serious, such as those that involve sexual assault or homicide. Arrange a consultation. It is best to have a face to face conference to determine if you feel comfortable with the attorney. Meet the lawyer and decide if you have confidence in his skills and feel confident in his analysis of your case. Remember that a consultation is not a binding agreement. You should schedule consultations with more than one attorney to make sure you are selecting the best one for you. If you feel that there is something disagreeable about the attorney, you do not need to proceed with that specific attorney. There is nothing wrong with consulting with an attorney and then choosing not to hire him to represent you. Put your best foot forward. You want to impress the attorney, just as much as you want him to impress you. You both need to want to work together. If time allows, meet with as many as 3-4 attorneys. This will give you a choice, but is also a small enough pool to keep you from being overwhelmed. Prepare a list of questions to ask during the consultation. This will help you make sure to get all of the information that you need. It can be intimidating to meet with an attorney. By preparing questions ahead of time, you will feel more prepared and less likely to forget to ask an important questions. Ask about fees and payment schedules. You can also ask for a list of similar cases he has worked on. You should ask the attorney what sort of trial strategy he would recommend. You can also ask about plea bargains and negotiations. Ask about your alternatives. You want to have all of your options clearly explained. You can ask, "Why are you the right attorney to handle this case?" The answer should give you a good idea of his plan and experience. You can also say, "How quickly would you begin work? What information do you need to get started?" Determine the other members of your legal team. During the consultation, ask the attorney about his staff. You should find out who will work on your case if you hire this attorney and what their experience level is when you meet with the attorney. Attorneys generally have assistants who help them fill in the blanks of the case. You should ask specific questions about assistants and paralegals. For example, ask what rates they bill at. Figure out how much work the lead attorney will do. What percentage of work will these other people be doing and what percentage of time will your attorney be dedicating to your case? Now is also a good time to find out what would happen to your case if your attorney became ill or unexpectedly became unavailable. Discuss the facts of your case with the attorney. Find out how familiar this specific attorney is with cases that are similar to your own. Ask the attorney how he would approach your case. At this point, the attorney should be able to discuss how he will proceed. You should discuss law office communications and what ancillary services he thinks you will need, such as expert witnesses or private investigators. The more information you can offer a criminal defense lawyer at your initial consultation, the more accurately the lawyer can offer to represent you at a realistic fee. Take your paperwork to the consultation with you. This includes bail paperwork, and any documents issued by the court, such as the charges filed against you, or arrest warrants. Allow your attorney to lead your defense. Many people feel like they understand the law. Maybe you feel like since the case involves your future, you should have a lot of input on your case. However, it is important to remember that the legal system is intricate and complex. Your attorney understands the law better than you do. You should feel comfortable with the defense strategy. But you should refrain from telling your attorney how to do his job. Remember that you thoroughly reviewed his qualifications before you hired him. You likely picked someone qualified for the job. Communicate openly. While it is important that you respect your attorney's methods, it is also critical that the two of you establish a good line of communication. You should ask questions about anything that you don't understand. You should also make sure that you are comfortable with his strategies and methods. Honesty is also key to a good working relationship. Do not ever lie to your attorney. In order to present the best possible defense, your attorney needs to have all of the facts. Remember, he is bound by confidentiality, so you don't need to worry about what you tell him. Get a support system. Being charged with a crime is a very emotional experience. You will likely feel scared, frustrated, and angry. Remember that it is normal to feel these, and other, emotions. Explain your situation to friends and family. Tell them you will need extra support during this process. Ask someone you trust to visit your attorney with you. This might provide some extra comfort for you. The increase seems pretty inexorable starting around 1970, doesn't it? If you're wondering where the lawyers live, a quick google search turned up this post which shows attorneys by state. 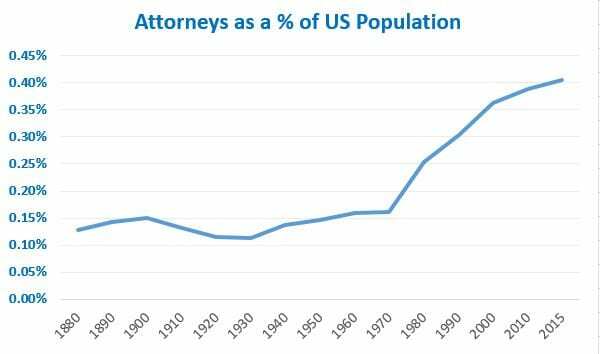 Needless to say, the share of attorneys as a percentage of the population is greater in the District of Columbia than any of the states, by far. 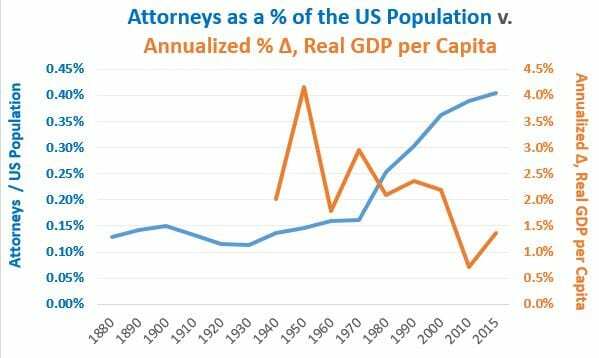 Data for ("resident active") attorneys used in these graphs comes are from the American Bar Association . The ABA's website seems insistent that anyone referencing their data should state it is "Reprinted by permission of the American Bar Association. All rights reserved." I am afraid to argue with them. Data and estimates for the US population originates with the Census, but I'm using the set cleaned up by the Texas State Library and Archives Commission since its in an easy to use format. Real GDP per capita comes from NIPA Table 7.1 . If you want my spreadsheet, drop me a line at my first name (mike) dot my last name (that's kimel with one m) at gmail with a dot com. The best book for any person who wants to understand how American Courts work! At times we all ask questions like "How can this criminal get off on technicalities if it is obvious that he/she committed crime? ", or "How can this be fair?" or "How can a lawyer defend this "bad guy/girl"? This is totally wrong! He/she is a criminal!" The author explains the difference between law and common sense, law and ethics, understanding of crime in legal terms and in laymen words.The book closely examines the logical reasoning of the law professionals , demonstrating the "tricks" used in court rooms. Fascinating reading!!! WARNING: the book will not prepare you to go to court and defend your case! This is not a "how-to" manual for folks who are planning to go to court. Hire a lawyer if need be. However, if you want to learn how to present and defend your point (any point, not just legal issues) as an intelligent and convincing person, this book is for you! Chances are, by the time you are done with debating your next case, your opponents will at least respect your opinion (or hate your guts, which still might give you some satisfaction). This book is for anyone who wants to boost up their skills in logical persuasion, finding loopholes in opponent's logical reasoning. Lots of interesting and valuable information for a pretty small price! It is written in a short and clear format: each chapter discusses specific idea, giving examples from court cases and average daily life (parent-child, husband-wife, employee-supervisor), concluding with a practical application summary argument vs. counterargument. So, no reason to read the entire book from beginning to end. One can just pick any chapter and read about how this or that legal (logical) rule can be applied in daily life. How To Talk To Your Lawyer So You Can Get the Results You Want Elura Nanos Esq., Michele Sileo Esq. In this guide to taking charge of your lawyer and getting results, Carroll presents a practical client-centered approach to legal services and project management. He offers good advice to locating the right lawyer for your job, negotiating fees, and keeping the lawyer's nose to the grindstone; Carroll also includes insightful portrayals of law firm operations. Unfortunately, Dancing is poorly organized and difficult to use. It is not meant to be read cover to cover, yet no index points the reader to the section that answers his or her question. The author himself suggests browsing as a finding aid. Finally, the omission of illuminating anecdotes make this book less entertaining than it could be. An optional purchase. - Elizabeth Fielder Olson, Archer & Greiner, Haddonfield, N.J. This book is an easy read and a must read for anyone who is hiring a lawyer for the first time, or wants to learn how to handle lawyers better than they have in the past. It shows you how to put yourself in the driver's seat instead of being at the mercy of the lawyer. I read the book then used the techniques to deal with a lawyer I hired for an estate dispute. I not only felt in control, I WAS in control. I was the employer, and the attorney was the employee, as it should be. Excellent information if you're new to the land of lawyers, and you need one for something greater than a speeding ticket. 5.0 out of 5 starsSmart advice, no lawyer jokes. When I was divorced last year and had to find a lawyer for the first time, this book saved me lots of frustration (and probably lots of time and money). It's very useful -- and it's even fun to read. The author's one smart guy. Everyone ought to have this book handy, because sometime, everyone has to hire a lawyer for something. Don't do it without this book. How to Get the Best Out of Your Lawyer A Guide to Engaging the Services of Legal Professionals - Kindle edition by Bart Daly.